Limitless workshop learning for your teams. The future of work will require dynamic teams with abilities like empathy, creativity, and critical thinking. The way companies train today can’t keep up with the rapidly evolving workplace. Instructor-led learning doesn't scale and e-learning wasn’t built to develop human skills. We blend the scalability of a digital product with the collaborative learning experience of workshops. Learn in teams anywhere with our guided workshops. Humans crave interaction, and tend to learn better with in-person environments. How we bring learning to life. 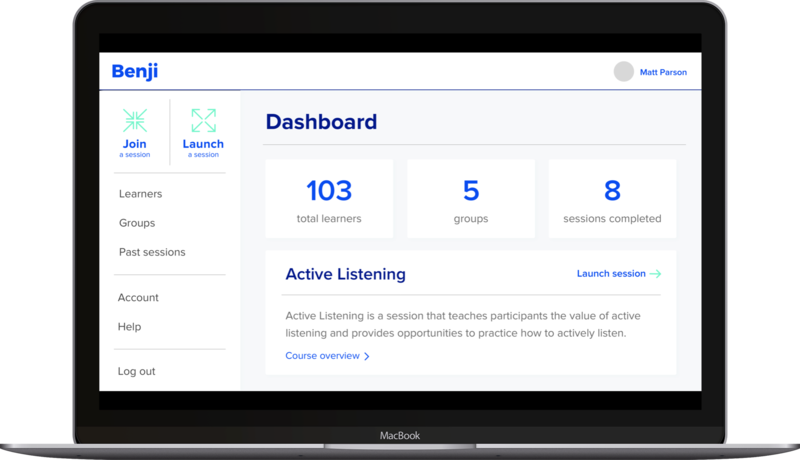 The Benji platform introduces learners to complex topics, guides groups through active play-based learning, creates moments of reflection, and tracks progress over time. It’s an engaging learning experience that doesn’t require a live facilitator. We bring expert trainers right to your teams through pre-recorded videos, where they introduce new ideas and guide everyone through the session. Our interactive activities get your teams engaged in the learning process. With hands-on experience, teams get the practice they need to build skills and improve performance. Benji combines data from a variety of rich assessment methods to track and guide skills development, giving you valuable insight into progress from the individual to the organizational level. Built to fit any learning program. 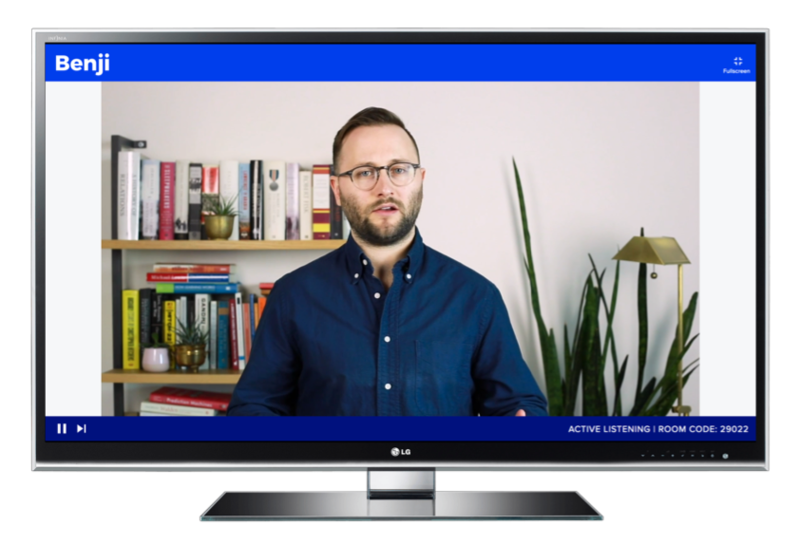 The content for Benji sessions can come from either your existing learning library or from one of our trusted, best-in-class training partners. As self-contained workshops, Benji brings a consistent learning experience to teams across an organization, regardless of geography. 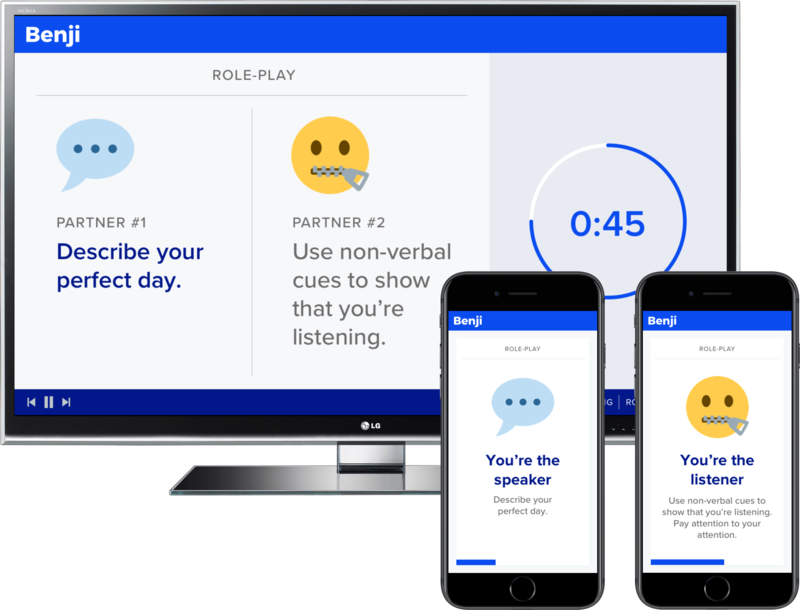 As practice sessions, Benji gives your teams the chance to practice and reinforce skills previously covered in a training engagement. Is Benji right for you? Create moments of personal connection to make learning more effective and foster a collaborative culture, helping improve employee satisfaction, job effectiveness, and retention. Benji takes the best from other methods of training, like collaboration in a workshop and the data capabilities of online training, to create a new category of learning that easily fits into the workday. Benji works as easily for one team or a thousand teams across your organization. Our innovative technology allows your employees to run their own learning sessions whenever and wherever they like. Interested in learning more about what Benji can do for your organization? Fill out this form and we’ll be in touch shortly. Interested in learning more about what Benji can do for your organization? Fill out this form and we’ll be in touch shortly. Read about how Benji has worked with organizations to improve their educational outcomes with our platform and approach. We partnered with MaRS to bring their online course to life with deeper engagement opportunities. We worked with Ryerson University to bring their students the skillset needed to become digital entrepreneurs.